So, we thought it would be fun to see whether a home made pizza could be tastier, quicker and cheaper to make than ordering a take-away from Domino’s Pizza, and here’s the result – along with a recipe for the homemade ‘Spanish Sizzler’! There’s just something about the take away that’s so moorish and bad. That being said, the homemade was just as delicious, but when it comes to the base of the pizza, takeaway wins hands down every time. There’s also a great selection from Domino’s pizza menu, so everyone can get what they like! 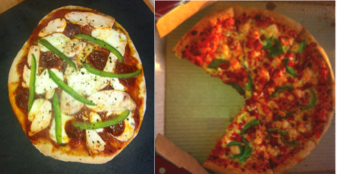 Domino’s – 8 out of 10 (A medium Spanish Sizzler costs £12.99 inc delivery and feeds 2, leaving you wanting maybe one more slice) / Homemade – 10 out of 10 (Cost around £10 for ingredients, but would have made 4 times as much as the medium Domino’s Pizza). SO, an Even-Steven! Whilst homemade is more economical – especially if feeding a family of 4! The flavour, experience and speed of a takeaway just can’t be beaten with home cooking… I suppose if it could, then takeaways would never be as successful as they are! 3. Add the yeast mixture to the flour, and mix together. 4. Empty the mixture on to a well floured work surface and knead well with your hands until it’s nice and bouncy. 7. Once the base is ready, tear off a piece, roll out and then place on a wire rack.